3/1943 James LeMaster enlisted in the United States Army just prior to his eighteenth birthday in March of 1943 as he feared that he would be drafted and not be able to finish high school. After he enlisted, somewhere near Cincinnati, Ohio, James went back home and graduated from high school before reporting for duty. 6/1943 James LeMaster grew up in a military family as his father served in World War I and fought in France against the Germans. James’ dad was very proud of his son for enlisting and going off to fight to protect the freedoms of the United States. James was anxious to join the Army and do his part to serve his country; however, the longer he was in the Army, less anxious he became as the novelty wore off quickly. 6/22/1943 James’ was inducted into the Army at Fort Hayes in Columbus, Ohio. Shortly thereafter, James was sent to Camp Wheeler in Macon, Georgia where he traveled by train from his hometown in Portsmouth, Ohio for basic training. James endured sixteen grueling weekend of basic training while stationed at Camp Wheeler preparing to go overseas. Camp Wheeler trained 200,000 troops between 1941 and 1943 for World War II. 8/1943 James’ grandfather had taught him how to shoot a 22-rifle when he was growing up but never anything larger than that. He was quite impressed with the M1 Garand which shot a large 30 caliber bullet, which he experienced while at basic training. James really enjoyed the shooting aspect of basic training but really did not like throwing the grenades; however, he nonetheless understood that he needed to know how to operate the grenades in battle, so he paid close attention during training and made sure that he would be able to execute the grenades without error. James also learned how to shoot the Carbine, which was a smaller caliber version of the Garand, mostly used by Officers because it was more easily carried while in the field. Surprisingly, James was just 150 lbs during basic training which was on the petite side for soldiers however, when he would later go overseas he was assigned as the BAR (Browning Automatic Rifle) man which was typically revered for much larger men. James carried the BAR in combat until he was promoted to a Sergeant and squad leader where he carried the M1 Garand. 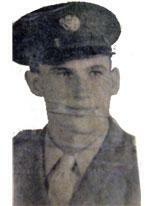 11/1943 As soon as James completed his basic training requirements, he was then given orders to go overseas. James had to take a train from his basic training location in Macon, Georgia up to New York. Due to the fact that James did not want to carry his duffle bag throughout the long arduous trek and train ride, he shipped his army bag to New York instead. In a twist of fate, James arrived in New York before his bag and unexpectedly, he was informed that his military assignment and orders had been changed. James was originally supposed to go to Europe; however, because of the delay with his baggage he was sent to the Pacific theatre. Once James received his belongings, he was immediately put on a troop ship that went south down the United States coastline then West through the Panama Canal and off towards the Philippines. 12/1943 The ship ride to the Pacific was really rough and very uncomfortable for James. They slept in bunks that were four levels in height on the transport; it was quite a tough challenge getting to the top. The bunks were made of pipes which made up the frame and ropes across which made the spring. While James was initially extremely excited about the new adventures he was embarking on with the Army and wide-eyed and optimistic regarding what lie ahead, he recalled that as the days progressed, the novelty became less thrilling as he began to internalize just what he had signed up for, at least the routines and regimes for Army life. While on board, each day could become very monotonous, therefore, the Army had many strategies for keeping the troopers occupied so that they would not get bored or out of practice with their skills and camaraderie building exercises. 2/1944 James arrived at Camp Riverina on the island of New Zealand where he was stationed for only a couple of days in order to practice how to climb off the cargo nets from the ship. It would become very important for James and the rest of his company to master with precision the art of getting off the ships. 2/27/1944 James arrived in New Caledonia for intensive training and preparation to be part of General MacArthur’s invasion and return to the Philippines. James was assigned to the 25th Infantry Division, 27th Regiment, E Company, 2nd Platoon. 12/17/1944 James departed Noumea, New Caledonia for the invasion of Luzon. 1945 Beer and cigarettes were routinely provided to soldiers during resupply. James did not care for smoking or beer, so he would become very popular with the other soldiers and happily trade both of his Army rationed allotments for his favorite coca-cola soda pop. 1/9/1945 James engaged in the invasion of Luzon, Northern Philippines by the 27th Regiment in Lingayen Gulf over White Beach 2. The battle lasted for one month. There was extreme fierce fighting trying to reach the objective of clearing Highways 3 and 8. Japanese defended the island tougher than the Solomons. 1/11/1945 James was part of the Northern Luzon Invasion on the beach middle of the attack going up through the valley. The soldiers had to scale down the cargo nets into Higgins boats which would take them right up onto the beach and drop the front gate where soldiers would run off onto the beach while being fired upon by the Japanese. The soldiers were used to riding on the waves of the rough Pacific Ocean, therefore, luckily, no one really got sick even though the ride was extremely rough. 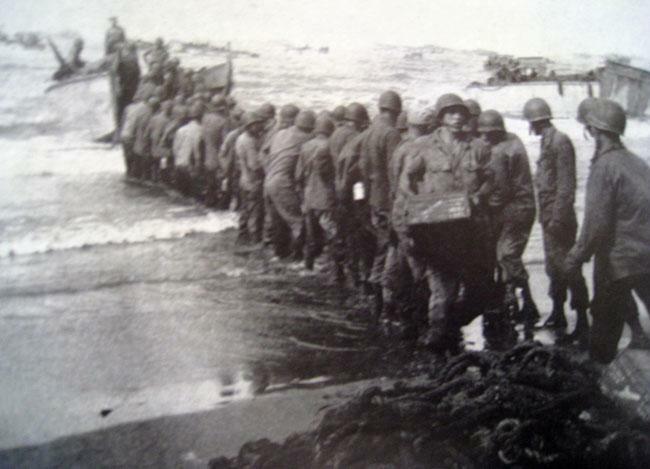 The first objective when getting to the beach was to find cover while helping the men on one’s left and right. The Japanese were heavily dug in and very few surrendered. The Navy was firing over the beach landings to soften up the Japanese while the Japanese were putting artillery on the beach so one had to watch out for both. 2/1945 A Japanese artillery shell exploded in the tree tops above James’ foxhole which blasted shrapnel into his back earning James his first Purple Heart. A medic removed the shrapnel in his shoulder and stitched him up without having to go to a hospital or miss combat action. 2/1945 Southern Luzon was more much difficult of landing because the Japanese put a lot more firepower onto the landing craft with machines guns and artillery. It was very difficult to get off the beach because it went up-hill and as soon as one would stick their head above the apex, the Japanese would attempt to sniper shoot and take them out. The artillery destruction of trees and the natural landscape made movement very difficult. During one firefight, James was moving along and fell into a hole and immediately after that felt an explosion which resulted in James earning his second Purple Heart and immediately came out of the hole. To this day James does not know what was in that hole. James was carrying three grenades in a pouch on his belt. One of the grenades has been ignited possibly from a bullet but he had enough strength from an adrenaline rush to get out of that hole to get away from it. By this time the medics saw he had got hit and started working on him. The grenade had blown a hole in his side. James did not feel a lot of pain until later. He was taken to a field hospital then transferred to another field hospital were a doctor took care of him. James still has 17 pieces of medal in his side. 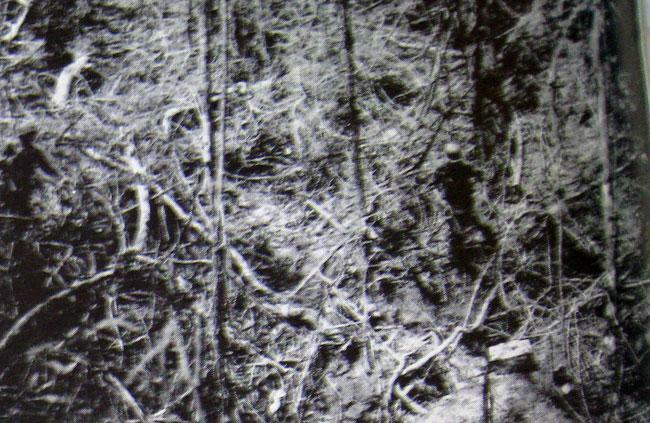 As difficult as it was for James to internalize and accept, the damage caused by the second explosion and shrapnel remnants would be the last scene of battle and end of World War II for James, while it would take him nearly nine months before he could return back to his home in the United States. 1/1946 James made his way home through the West coast and had to take a train from California to his home in Ohio. James’ girlfriend sent him letters and every day and within 4 months of returning him they were married. James’ father worked at the post office so his girlfriend received mail special delivery frequently. They are still happily married 63 years later. Philippine one peso from World War II. The thick and dense tropics of the Philippine islands. Getting off Higgins boats to invade the beaches of Luzon during World War II. 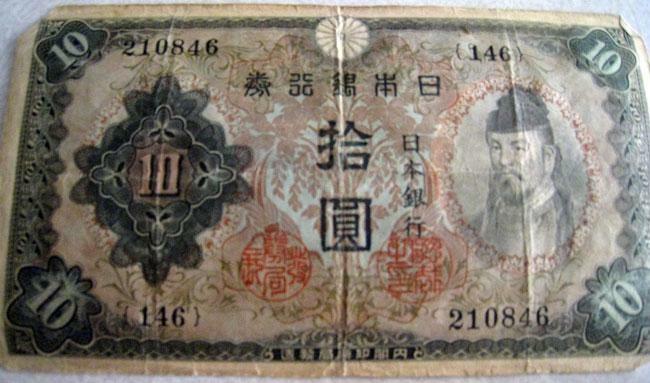 Japanese currency during World War II. Extremely think underbrush of the Luzon island. One could not navigate through the brush without cutting a path. 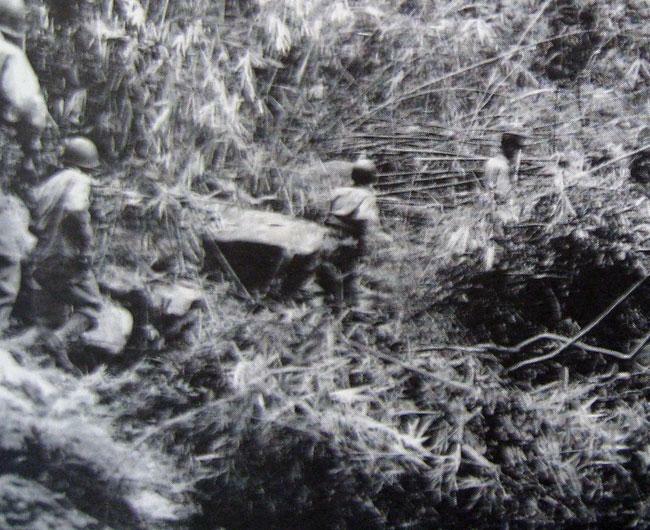 Getting supplies onto the beach during an invasion by the 25th Infantry Division in the Philippines. 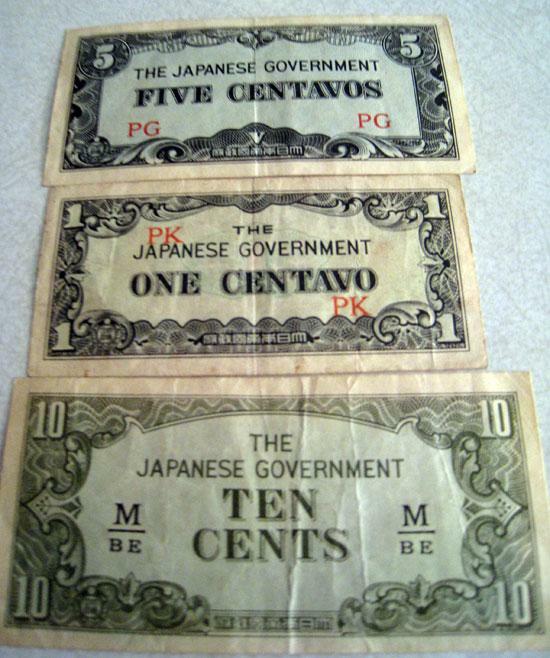 Japanese Government Centavos currency. 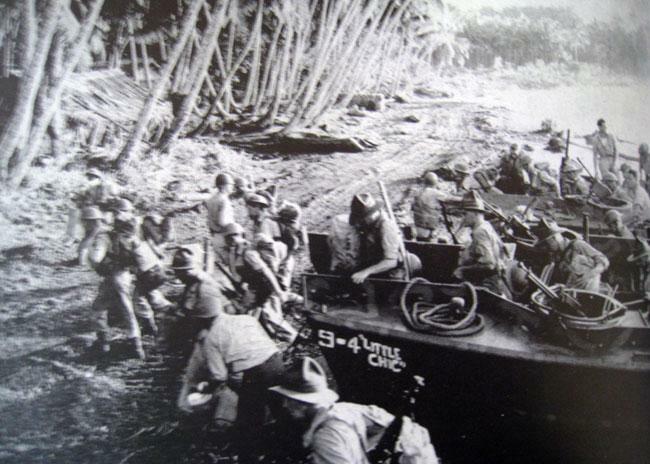 Rushing out of a Higgins boat during the Luzon Invasion. James was part of multiple invasions in the Philippines. One Victory Pesos. 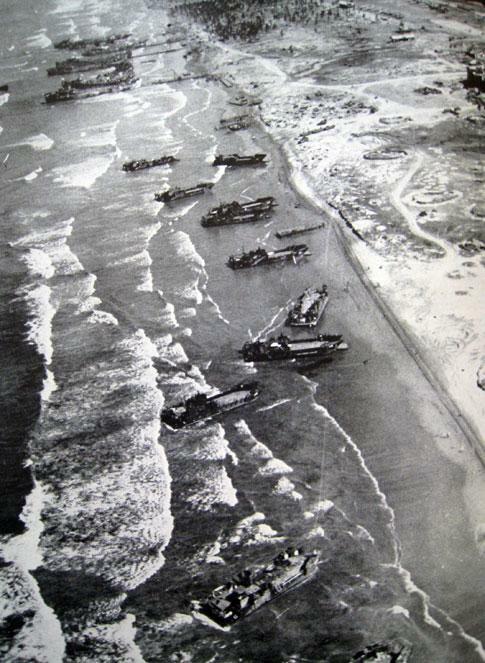 Lingayen Gulf invasion, Luzon, Philippines. James road in a Higgins boat to the beaches of Lingayen Gulf. 25th Infantry is known as "Tropic Lightning." 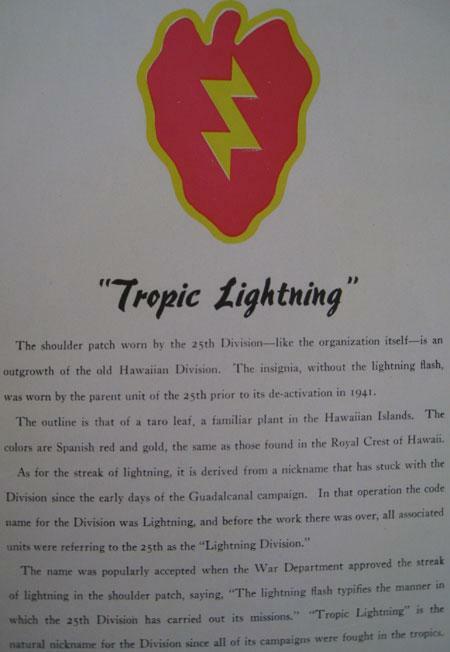 The 25th division originated in the Hawaiian Islands and was known as the Lightning Division. The name Tropic came from that fact that all battles were in the tropics. 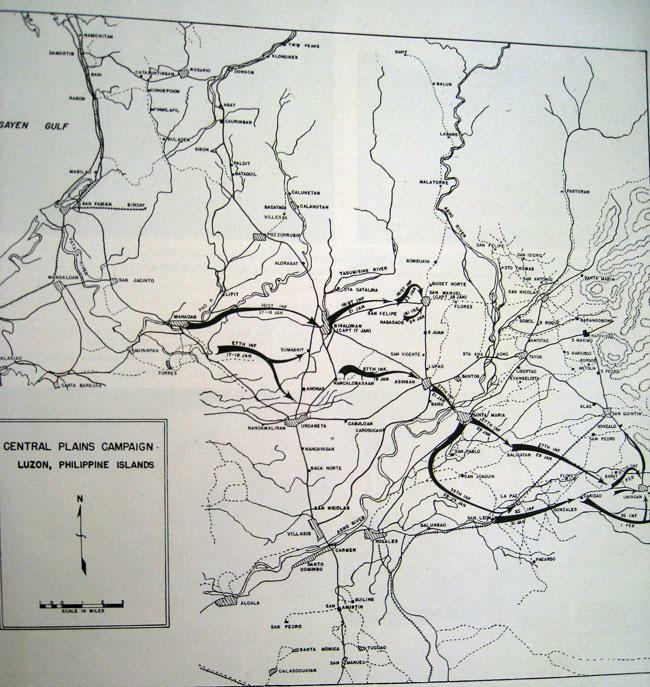 Central Plains 25th Infantry Battle Campaign Map Luzon, Philippine Islands. James LeMaster's Purple Heart earned while in the Pacific War in World War II. James was awarded the medal two times, once for being with shrapnel from a mortar in North Luzon, Philippines. He was also hit in Southern Luzon by a sniper bullet that exploded his grenade on his belt. The grenade hit ended James' military career. James LeMaster talks about the BAR, M1 Garand, and M1 Carbine in World War 2. James receives his second Purple Heart during World War II. A sniper's bullet hit his grenade which exploded.